When you hear the phrase “think outside the box”, that doesn’t mean that if you do…it’s automatically a good idea. Plenty of technically original movies, for example, are terrible. Call me crazy, but when it comes to Christmas, I want a movie to lift my spirits. The holidays, in general, can be depressing, so who wants to watch a depressing Christmas movie? The Fitzgerald Family Christmas isn’t just depressing, it’s depressing in the worst way. If done right, depression can be done respectfully very well. This film literally takes as much depressing ideas as it can possibly muster, throws them together like a collage, and calls it a movie. Not sure if I can accurately place the plot of this film other than to say a really huge family is trying to decide whether or not they should allow their estranged father back into their lives after he left them twenty years before. The situation itself gets a bit more difficult when they learn about a crisis that the man has been dealing with for the past year. Other than that, every member of the family has their own story to tell with other depressing stuff. Well Merry Christmas to you too. Seriously, what was their real plan by throwing in as much depressing stuff as they could muster into one story? How does that make this film good? It just ends up playing like a melodramatic soap opera, nothing more, and nothing less. It’s funny, because the way it is filmed seems to equate with that of an ensemble cast film, which I also hate. The thing is, ensemble films are at least good for usually being comedies and having a good number of recognizable faces, so if you were to watch them…you could at least have fun watching your favorite actor. Not so here! No, this “ensemble” film is made up of wannabe actors that honestly aren’t that great, nor have the ability to be loveable. I get the thought process into throwing in depressing issues, because real people deal with these types of issues day in and day out, and the holidays are a depressing time. I do get that, but there’s just too many for the film to even focus on. It’s the whole thing about ensemble comedies trying desperately to keep a story firm while balancing equal focus between a never-ending cast. To give them all depth, they all apparently needed baggage, but the baggage just weighed down on the film itself. I can’t say it enough, it was just too depressing, especially for a Christmas film. As I mentioned in my intro, Christmas films should be predictable in the sense that they aren’t depressing. Spirit and soul are important elements. We’re talking about a movie you can be playing in the background while you’re hanging the mistletoe, or putting up the tree, or lights, or any type of decoration. While you’re making Christmas dinner or cookies, Christmas films are feel-good movies for a reason. This movie just makes me want to skip Christmas and avoid it like the plague, which in my humble opinion is the very last thing that the film should do. 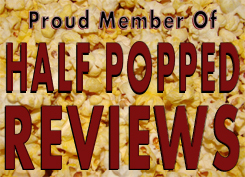 Also…the actors and the acting were forgettable at best, but I’d just go ahead and call it “stale”. Now I do bid you farewell, because this film has left me with a bad taste in my mouth. Watch it if you want…there are some good things about it, but honestly…not much if you ask me. Well…the movie had good intentions…I think. 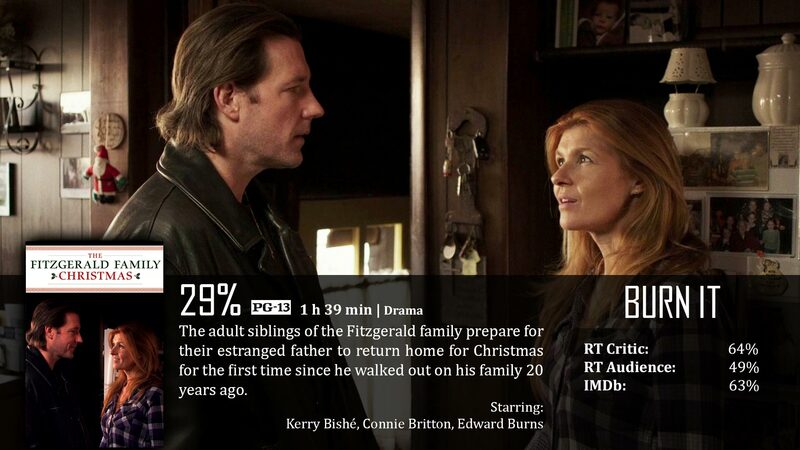 Go on IMDb, find the site for The Fitzgerald Family Christmas, and open up the “Full Cast and Crew” page for the film. That entire list fits into this category. You’re welcome, world.